Umm really? Is that even a question? 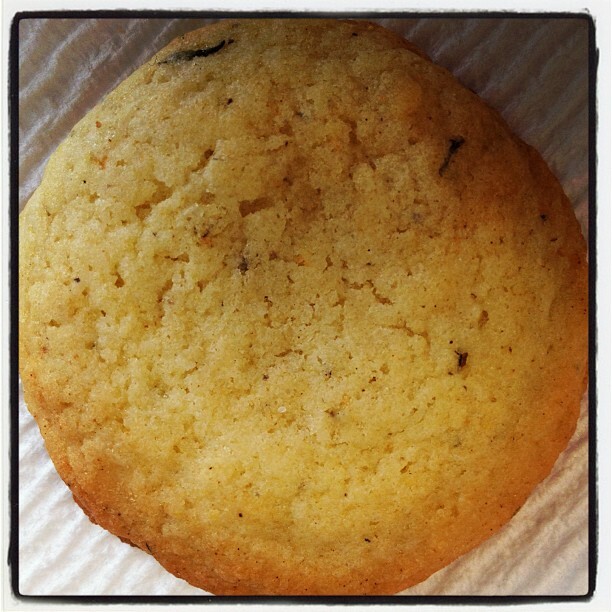 Let’s examine everything that is right with the words Lavender and Thyme Cookies. Lavender: right! Thyme: right! Cookies: so so right! And so yesterday, after confirming they were allergy safe for me, Julie brought me two cookies. I have to say there was one major problem with them which was; SHE ONLY BROUGHT ME TWO! If shared between historical adversaries, these cookies could bring about world peace. Seriously, these cookies were “knock your socks off, I want to cry they’re so good, I can’t stop thinking about them, when can I get my next fix” good. They’re buttery and not overly sweet with that beautiful aromatic and earthy flavor of lavender and then this subtle herby kick from the thyme. I’m going to try to get Julie to guest post because this is a recipe that needs to be shared with the world. We can argue about a socialized health care system or America’s involvement in foreign wars, but I think we can all agree that great cookie recipes should be shared. There are two things in the world I love almost as much as food; beer and wine! So how awesome is it that I have a good friend who works in the wine industry and invites me to cool events? The answer is, really freaking awesome. 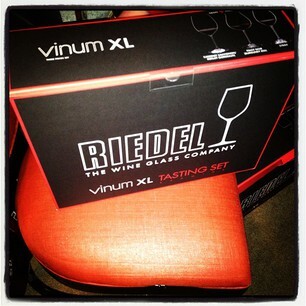 Last night I attended a Riedel Vinum XL Tasting hosted by CEO Maxmillian Riedel. 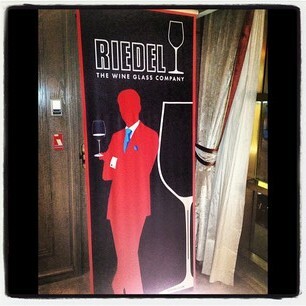 For those of you who don’t know, Riedel is the premier wine glass maker in the world. They are like the Rolls Royce of wine glasses and the goal of this event was to teach participants how different glasses effect the experience of different wines. 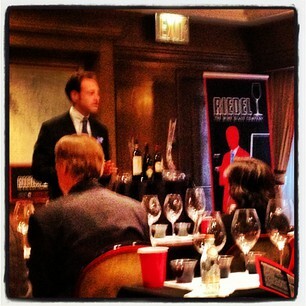 We compared three different wines in three different glasses; Pinot Noir, Syrah and Cabernet Sauvignon. 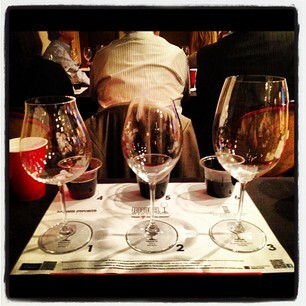 In each and every case the wine was clearly best in its corresponding glass. When drinking the wine in the “wrong” glass you noticed that the wine that had lost of fruit suddenly became flat or the wine with the rich aroma of oak and vanilla suddenly had an unpleasant bitterness. One of the most interesting parts of the tasting was at the end when Maxmillian said, “as wine drinkers, I’m sure you’ve been to plenty of tastings where you meet the wine maker and they ask you to sample their wines.” We all nodded. “And what,” he asked, “do they serve you their wines in? A plastic cup.” Maxmillian then asked us to pour our wine in to one of the plastic cups in front of us and smell and taste it. The change was unbelievable. It was as if the wine lost every single characteristic, good or bad, in the plastic. Riedel does these wine glass tasting all over the country so if you don’t believe me you should sign up for one yourself and see. If you can’t get to a tasting at least try this; buy a nice bottle of wine. There are a lot of really nice wines out there for under $15 so you don’t have to spend a lot of money. Then pour some in to a small “white wine” glass, a larger “red wine glass” and a plastic cup and sniff, swirl and sip. You’re results probably won’t be as dramatic as drinking out our beautiful Riedel glasses, but I guarantee you’ll notice a difference. Oh, and the best part, we got to keep the glasses! Fun fact: Restaurant Noma in Copenhagen is currently considered the number one restaurant in the world. Another fun fact: The renowned chef/owner of Noma, Rene Redzepi, is exactly one day younger than me. I’m thinking of writing to him and asking if I can get a meal on the house. Since we’re practically twinsies not to mention the fact that I’m quite the Dankofile (yeah, I totally made that word up) I figure it’s the least he can do, right? After graduating from college I spent six months living in Copenhagen and I fell absolutely in love with Denmark. I made great friends and have travelled back often to visit over the past decade. but surprisingly I’ve never made Danish food so the 26 Dishes project seems like a great place to start! 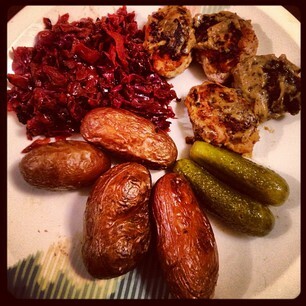 Today I’m making Frikadeller, Danish pork meatballs, which are a classic Danish dish. Keeping things traditional I’m serving them with potatoes, pickles and braised red cabbage, (though I’m using a red cabbage recipe I’ve made for years, but it’s very similar to Danish braised cabbage so whatevs). I could write a novel before I get in to the recipe about why I love Denmark so much, but instead I’ll just show you in pictures that I’ve taken throughout the years. Enjoy! We are Danish meatballs. We are the happiest meatballs in the world. Like most traditional Danish food this meal isn’t fancy or nuanced, but it is hearty and tasty. I loved these because they tasted really authentic and reminded me of being back in Denmark. The pork is often mixed with veal, but I stopped eating vel when I was about 9 or 10, marking my first foray in to conscious eating. 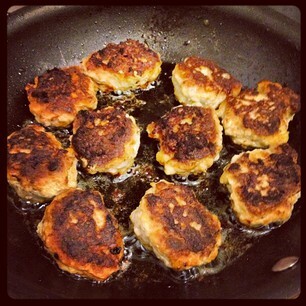 Even with just using pork and frying them in loads of butter, these frikadeller are surprisingly light. Another reason to love Denmark is that they have some of the strictest food and agricultural standards in the world so, as with all my meat recipes, I really hope that you buy high quality, hormone and antibiotic free, ethically sourced pork such as Niman Ranch. And if you want to be truly Danish. make sure to wash down your frikadeller with lots and lots of beer! Now that’s a Viking plate! My mom found this recipe in the NY Times about 300 years ago. The Imagine Better Project has partnered with Oxfam to encourage young people to take what they’ve learned from the themes of the Hunger Games books and apply them to the real world. The Hunger is Not a Game campaign website has several ways for Hunger Games fans to get involved in global food justice. These include signing Oxfam’s GROW pledge or “sending a silver parachute” (something us die hard Hunger Games fans totally understand) by organizing a food drive. The campaign also asks that you tweet about the topic using the hashtag #notagame. The Hunger Games movie is expected to do $90 million dollars in it’s opening weekend. That means a lot of people, including myself, will be going to the theater. Now imagine what we could do if every one of those people took action! When you have an eclectic group of friends from diverse backgrounds you often get awesome food gifts. If there is a better case for multiculturalism than that, I don’t know it. Pip pip cheerio. We're from merry old England. I try not to buy any Hersheys products because Hersheys is a pretty despicable company. This isn’t usually very hard for me considering I’m not much of a chocolate eater, I shop mostly organically and forced child labor tends to leave a bad taste in my mouth, but then there are Cadbury Creme Eggs. 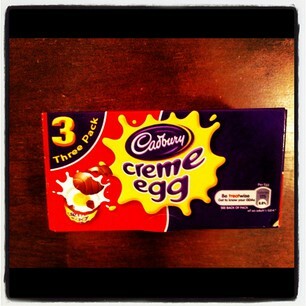 Recently my friend Janet, a British ex-pat (and consultant for my Fried Rice experiment) returned to England for a visit and came back to the US with a surprise for some of her friends; the real deal, straight from the UK, no Hersheys involved at all, Cadbury Creme Eggs. Best. Souvenir. Ever. Oh bloody 'ell just eat me already you wanker! 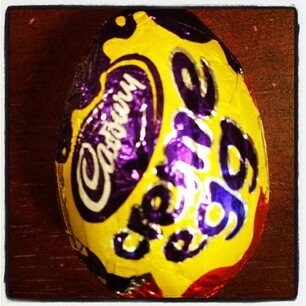 Every English person I know insists that Cadbury Creme Eggs in the UK are far superior to their American cousins. Now that I’ve tried my first one here’s what I can tell you; the chocolate in the UK version is undoubtedly better and the fondant much less sweet. I do think the fondant in the US version is too sweet, but I think the UK version could be a touch sweeter. A level of sweetness between the two versions would be perfect. Textruraly the UK version are perfection. I’d say the chocolate shell is ever so slightly thinner making it easier to bite through and the fondant is even creamier and less granular. Huge points to UK on texture. All in all, due to texture, I think the UK version edges out the US version, but only by a hair. I made Chinese food! You have no idea how excited I am. I don’t eat Chinese food. Correction, I can’t eat Chinese food or most food from the continent of Asia. Asian dishes are filled with ingredients that I’m severely allergic to; sesame, beans, sometimes nuts and a variety of fruits that are a no-no for me. One thing on the menu coming out of a kitchen serving nothing but foods that have the potential to kill me. Does that sound like a good idea to you? Let me put it to you this way; you walk in to a room one day and notice something innocuous in the center of the room, let’s say a bouquet of flowers. Now you obviously can live without the flowers though they might be nice to have, but here’s the problem; you notice that the rest of the room surrounding the flowers is rigged up from floor to ceiling with death traps. Everywhere you look is barbed wire, grenades, land mines. Now think, are the flowers really worth it? I didn’t think so. So no I don’t normally eat Chinese food, but imagine my surprise and delight to learn that I safely could make Fried Rice and keep it reasonably authentic! After much Googling and confirming with my friend Janet, whose parents hail from Hong Kong, I’ve learned that Fried Rice is very traditionally Chinese though not necessarily the way we find it in American restaurants. 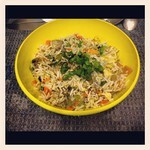 Fried Rice, I’ve learned, is basically a great way for Chinese moms to use leftovers. You can basically put whatever you want in to it which means I don’t have to put in anything I’m allergic to make it authentic. The only must for traditional Fried Rice is that you must use rice that’s at least one day old. Though I wanted to keep the flavors Chinese, I didn’t want to buy entire bottles of Fish Sauce or Chinese Five Spice so I made “Fake A** Fish Sauce” and used the 3 out of 5 of the Chinese Five Spice Mixture that I had. Basically I infused the oil with the Garlic and Ginger first and then threw in everything but the sauce. When it was done I put the Fried Rice in a bowl and mixed in the sauce. This was a really fun thing to make since what you put in to it is entirely up to you. I believe strongly in limiting meat consumption and like to always have a stash of vegetarian recipes so, other than the anchovy paste, I kept this veg, but if I ever have meat leftover in my fridge I would definitely throw that in. Also, my friend Janet offered to give me some of her stash of dried shrimp which I would definitely like to try adding in next time. All in all this is a great idea for repurposing leftovers so if you make it don’t be afraid to get creative. If you have kids this would be a great recipe to involve them in too. Kids tend to be more adventurous eaters when they’ve had a hand in the process so let them choose the vegetables they’d like to go in to the Fried Rice and, depending on their ages, have them help with some of the prep.